NSR's Question: Is “Sticky” Good Enough In Maritime? Fact: Satellite operators are searching for places in the value-chain where they can move down and increase margins. One of those places for improving margins is creating ‘sticky’ end-users who will have high retention or face significant switching costs. For markets like DTH, video neighborhoods and the cost of re-pointing household antennas create ‘sticky’ customers. In the mobility sector, ‘capacity ecosystems’ provide segments of satellite capacity where end-users will roam within a satellite operators own fleet. A classic example of a capacity ecosystem for maritime mobility is Inmarsat’s L-band network, where the satellite operator provides the transport layer, and service providers focus on the application and end-user relationship. Using data from NSR’s Maritime Satcom Markets, 4th Edition, the market for broadband maritime connectivity by 2025 will be worth approximately $3.3 Billion. Of that, $2.2 Billion will be from geostationary FSS & HTS C/Ku/Ka-bands (where we see the majority of these ‘capacity ecosystems.’) At the same time, revenues will start to tip mostly from FSS capacity, to HTS capacity. It is that transition that helps fuel the development of these capacity ecosystems. The real question, however, is who will create the ‘sticky’ factors to help lock-in end-users amongst their capacity holdings. An example of creating ‘sticky’ is the strategic partnerships recently announced by Marlink and SpeedCast with Inmarsat to connect 4,000 vessels to the Global Xpress network over the next 5 years. While the details remain vague (are these current Fleet Broadband customers? Or current VSAT-equipped vessels? Maybe new vessels entirely? ), the aim is to replicate the L-band ‘capacity ecosystem’ into the VSAT world. Moreover, will these customers be Marlink or SpeedCast customers in the same sense as the VSAT world where end-users are associated with their service provider (rather than the satellite operator), or will they simply be “Fleet Xpress” end-users? Fiction: Capacity ecosystems are limited to satellite operators. 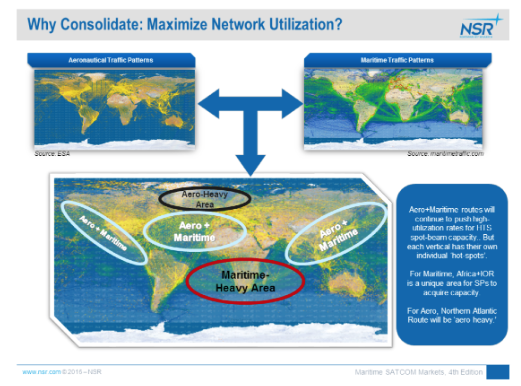 Outside of Inmarsat’s unique position in the maritime industry, will C/Ku/Ka-band have similar ecosystems? Yes—both from satellite operators themselves, and from service providers. For Intelsat, their capacity ecosystem goes by the name of “Intelsat One Flex” (in GEO FSS and HTS C/Ku/Ka-bands), for SES it is called “SES +” (with GEO and Non-GEO capacity), and other satellite operators are surely devising plans of their own to create similar offerings. Cross-market consolidation across aeronautical and merchant maritime is leading to the rise of ‘service providers provider.’ Although there has always been the semi-formal trend within the maritime industry of reselling capacity to third parties (such as MTN or Marlink reselling capacity to service providers focused on specific niche sub-segments), it is rapidly expanding. Even from as long ago as 2009, KVH and ViaSat developed a partnership to provide global Ku-band coverage for the maritime industry, leveraging ViaSat’s capacity. Today, service providers like Panasonic Avionics and Global Eagle Entertainment will be at the forefront of these ecosystems as they stitch together their own networks of capacity from different satellite operators (rather than the satellite operators themselves.) Alongside capacity ecosystems under development by satellite operators, there is one clear trend—the business of creating bits from hertz is under significant pressure for those without scale or ‘sticky’ customers. No longer tasked with the primary duty of stitching together capacity from various satellite operators or creating bespoke networks on an end-user by end-user basis—will service providers gain enough value-add to support a robust number of market players, or will it force further consolidation in the service provider layer? These ‘capacity ecosystems’ from satellite operators will be one of the key developments in the maritime market going forward as network complexity increases and HTS coverage remains geographically limited outside Ka-band. 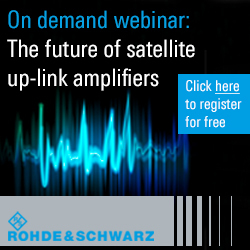 As more end-user vessels adopt C/Ku/Ka-band based broadband connectivity, the relationship between satellite operators and service providers in the value-chain will become more complex. That relationship change is creating new competitive pressures, consolidating buying power amongst a few larger service providers, and aiming to be a disruptive force in the maritime market going forward. More specifically, it is changing the ‘sticky’ conversation to one about the applications running over the network and the service provider enabling those applications. Is the business of ‘making and moving bits’ rapidly coming to an end in the maritime space? The short answer is no. Marginalized, yes—but what is primarily occurring is consolidation within the service provider layer, and a greater shift towards the application layer. The CAPEX investments required for HTS favors a plan of ‘maximizing network utilization’, by finding complementary end-user usage patterns both in terms of specific end-users, and vertical markets. That takes scale. Without scale, HTS investments make little sense for providing coverage to mobile end-users—and, that is where capacity ecosystems come into play. Deals like OmniAccess and Panasonic for HTS capacity portfolios are only going to increase. At the end, ‘capacity ecosystems’ are no longer the domain of the satellite operators moving forward. Article IS “STICKY” GOOD ENOUGH IN MARITIME?